All our wines come from the grapes of the Estate, grown on our vines on the property, and are matured in wooden tuns or barrels from 11 to 22 months before being bottled on the Estate. Various grape varieties are grown here, such as Chasselas, Chardonnay, Viognier, Sauvignon Blanc, Pinot Noir, Gamay, Gamaret, Garanoir, Merlot, Cabernet Franc and Syrah. 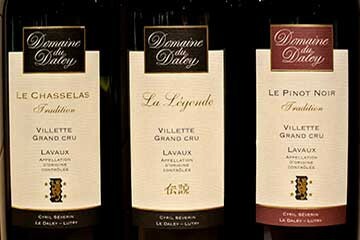 More than 13 hectares combined in Lavaux for 4 appellations :Villette, Epesses, St-Saphorin and Lutry, as well as two further hectares situated on the Coteaux de l’Orbe in the case of the old Gamay vines. 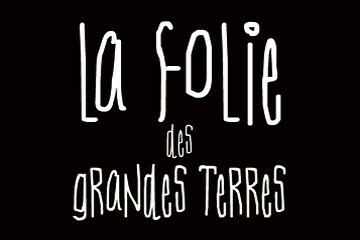 The wines are the result of sustainable farming, including cultivating the soil and harvesting the grapes by hand in order to extract the best fruit possible, allowing each its own unique terroir flavour, all classified as “Grand Cru”. 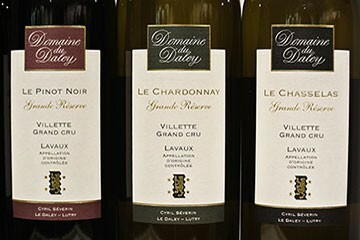 We offer you two ranges of wines. The Tradition range consists of wines matured for 10 to 11 months in wooden vats (tuns from 2000 to 5000 litres) and yielding fine wines with a lovely mineral character. The Grande Réserve range includes wines matured for 11 to 22 months in barrels (or partly in barrels depending on the wines) and developing more complex structures, unfiltered in the case of the red wines.